Ryan Atkin says his mental health has improved along with his performances as a referee since he first discussed his experiences as a gay man working in football. 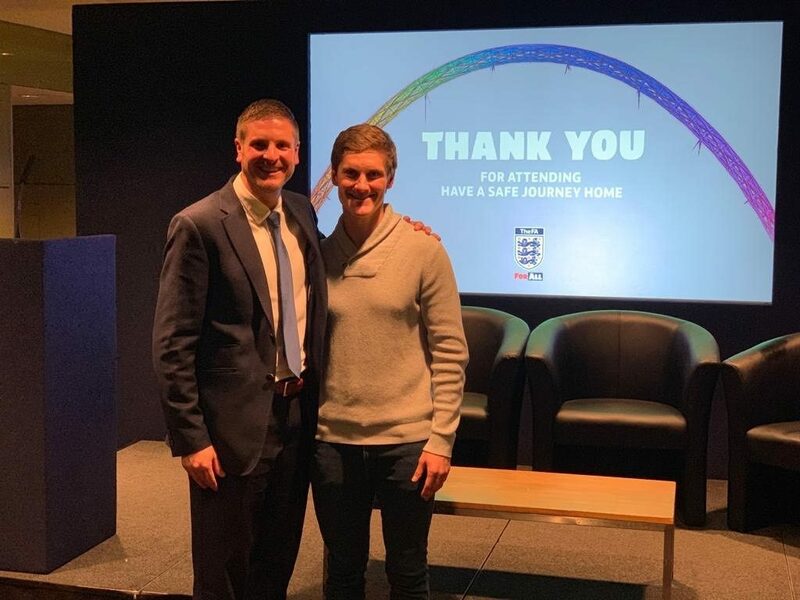 Atkin made headlines around the world in August 2017 when he told Sky Sports that he was coming out publicly in order to further positive conversations around LGBT+ inclusion in the professional game. Over a year and a half later, he not only continues to take charge of matches at National League North / South level but has also become a respected voice on matters of equality and diversity. Speaking on a new episode of The Gay Footballer’s Podcast, the 34-year-old says he is now “a lot happier” in all aspects of his life, and that others who are out will appreciate the previous difficulties he faced as a result of being in the closet. “I’ve benefitted personally from being true to myself,” Atkin tells podcast host Adam McCabe. “I’m sure people will identify with the fact of how much it drains you mentally, having to hide things, put people off the scent, or think about ‘I can’t be in this picture, I can’t do this or that…’, especially with things like Instagram or Facebook, and all the media now around sport. Atkin says coming out publicly has given him a psychological boost, with the effect on his self-confidence, his wellbeing, and his performances on the pitch being clear benefits. “Mental health currently is something that is such a big topic in the world,” he adds. “Every year, we’re understanding more about the human brain and emotions, and how it affects us. “I know for myself that I’m a better referee now. I can bring my whole self to the game, I’ve got better empathy, I’ve got a better relationship with the players… I’m not saying I didn’t have that before, but I was certainly lacking things. I was lacking the spark that I feel that I have now going into games, and I’m sure that would be said for players themselves who have come out and said why they’ve done what they’ve done. Atkin accepts fully that there are myriad reasons and complications which discourage the vast majority of gay and bisexual men in professional sport from being publicly out. However, he hopes understanding will grow around the sense of freedom and relief that being open about sexuality can bring to an individual who is gay or bisexual, particularly when working in an environment which is seen by many as being traditionally ‘masculine’. “It’s important for people to realise that there are so many different factors when you’re playing or involved in sport that can change you as a person – your personality, the way you approach decision making, etc. Listen to Ryan Atkin’s interview on The Gay Footballer’s Podcast. Also available on iTunes. This entry was posted in Gay Footballer's Podcast, Network News, The LGBT Line. Bookmark the permalink.